Mobile Operating system is the utility which helps to operate your mobile device. In the modern mobiles it combines the personal computer features with the other mobile features. Normally the smartphones have two operating systems. The facilities of the user facing operating system is increased by a second low level real time operating system. This is use to control the radio and other hardware parts. So basically the operating systems plays a main role there in your mobile phone. 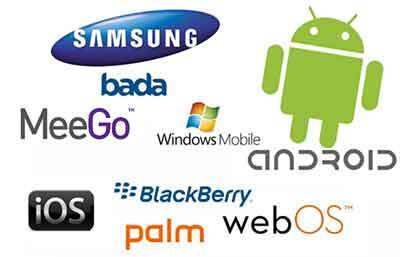 The main operating systems are Android, BlackBerry, iOS, Symbian, Windows, BADA, Palm OS, Open WebOS, Maemo and Meego. Other than these you will find many more operating systems in the mobile industry. Out of all these Android is the market leader. As its eye catching appearance and well organized nature Android is a great threat to IPhone. Google released the first Android version on 2008 September and it spread along the users easily and quickly. Currently the version in the market is known as Jelly bean and it have many significant features where all the leading devices could use. Symbian was the earliest operating system which lead the market. It is invented by Nokia and still it's used by the low end phones. Due to the introduction of Android the demand for Symbian operating system got decreased. Nokia has done the changes to use this operating system in the smartphones by upgrading it in toan efficient manner. Symbian operating system is very user friendly and it's well-designed too. This is mostly used in Nokia dual sim phones. When it comes to iOS, it was introduced with the first iPhone on 2007. Still no other manufacture can use this operating system and it mainly concentrate on the performance not the appearance. When compared with the others it's very user friendly and is known as one of the best operating systems in the world too. The first release of the Blackberry OS was done on 1999 by RAM. It was mainly targeted the smartphones and this operating system is very much different from the others. This operating system is well known for a reliable one and it is safe from viruses also. Windows operating system is very similar to the operating system which we use in our computers, but most of the users feel it very difficult to work with it. But people get used to this managed things very efficiently and accurately. Latest release is known as windows 7 and its very user friendly and very colorful too. These changes helps to give it a new look and it can be used by the devices made by Nokia. Nokia Lumia series is totally windows based. For PDA's Palm OS is the ideal answer and it was done on 1996. It is mainly designed to work with touchscreen GUI. The upgraded version is supported to all the other smartphones too but due to some reason it did not catch the market. BADA, an invention from Samsung. This was designed and developed for mid-range smartphones as well as the high end smartphones. This is also a user friendly and efficient operating system but it's not so much popular among the Samsung user and the reason is still known. As said previously there are many more operating systems which you can check and use in this mobile industry but described are the main.